Just starting a low tech tank today actually filled the tank and wanted a place to refer to as far as what is occurring over time. expecting plants beginning of next week. Using BDBS as substrate, adding slate over this upcoming weekend to scape and will be dosing as Tom Barr's instructions for a Walstead inspired tank. Aim to possibly have a betta sorority at some point or at least a betta with snails, otocinclus, ember tetra, and possibly a few corydora. Betta will be added last and as young to prevent aggression, though behavior will be monitored regardless. Double checked hardness and actually much closer to about 150 ppm, misread the colors and thought about diluting with distilled water, will leave as is for now I think. Once I get my plants in I'll be posting pics, especially so I can compare month to month the melt and then new growth. Right now it is a tank with black sand and and water and that's about it lol. 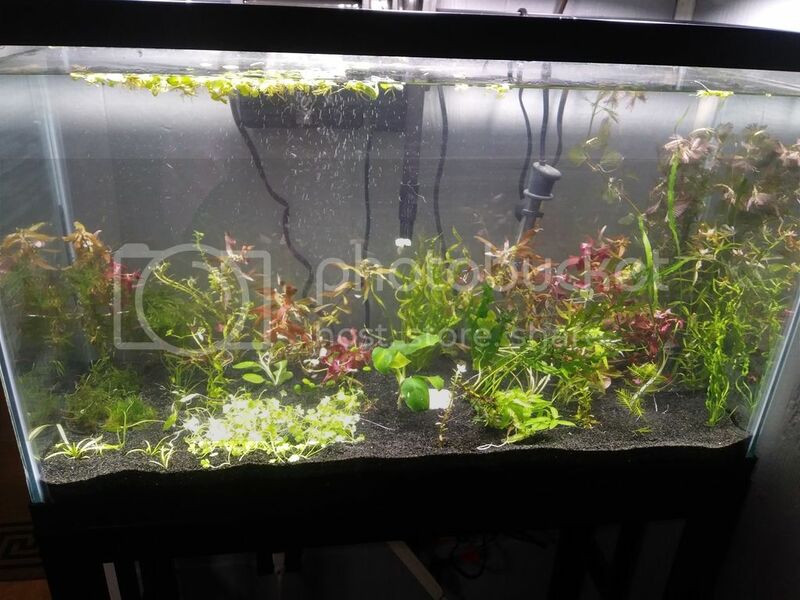 Plants to arrive Monday, Sunday should be getting some slate for the tank and setting up lights, which will be led's in brooder type fixtures hanging from a chain so I can adjust height if need be. Hoping to post picture after addition of slate and lights. Here's first shot of tank after initial planting, need rocks yet but sometime soon I will have some for those with rhizomes. Really happy with my first purchase on this site. I may rearrange some things after a couple days, shouldn't bee difficult, moving anything around in BDBS is super easy and very little dust since I did a vigorous rinsing of it beforehand. Thanks I appreciate it, that was my first attempt at posting a picture, theres a learning curve. Hoping to get some rocks soon or driftwood and will rearrange and update then. Rearranged the tank a bit and added a few rocks, there's one picture missing of the left rock covered in java moss but here's a few pics for now. the rocks are raw amethyst from my wife that she had hidden somewhere and a chunk of a flat bed of quartz crystals turned upright, then another holey quartz rock is covered in java moss on the left. 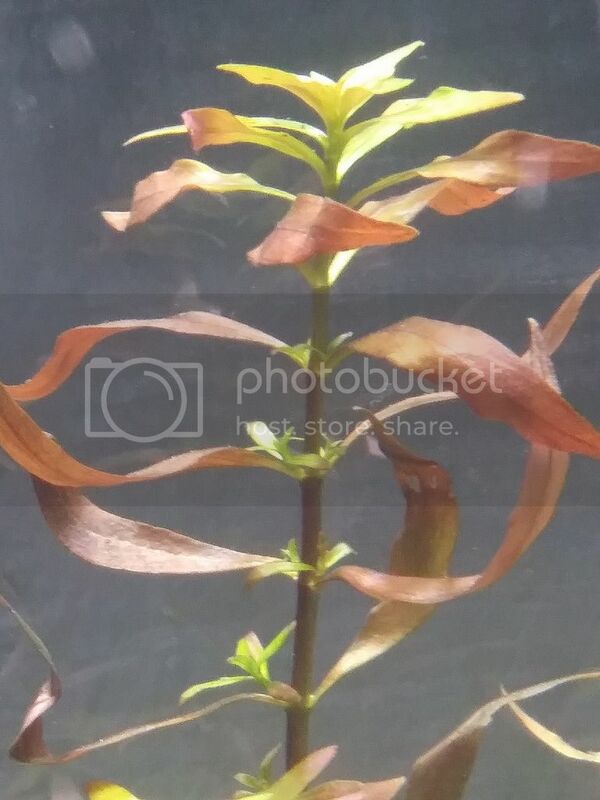 seems like new growth is already showing after only a week on ludwigia, though i wonder if it is because i the plants i got were healthy or if it is doing well enough already. i did do a dosing already though i used no equilibrium to start because my water is already a little on the hard side. let me know if these links work, i guess i have a hard time linking photos. ipkiss and tredford like this. Tanks seems to be doing well, now considering adding fish in the next couple weeks and debating on which to add first. Once I confirm parameters are in order I need to add ember tetras or ottocinclus, though there's much talk about otto's. Seems they are sensitive and need a more aged tank from what I read, though I also read people just plop them in with no problems. Wondering about which to add first or about adding a few of each to start since it Would still be such a small load for the tank. An another note, new growth can be seem atsrting on most all plants, seems most melt back is ovwr and plants are starting to spring back after 1 week. Parameters look good except for presence of nitrite which I think may be from the random bottle of safe start I added just because I had it on hand. I added enough safe start for 40 gallons because I had it on hand and fogured why not, it cant hurt much and will keep tabs on parameters before adding fish, soonest I would add fish is probably upcoming weekend if all seems well enough. I've read some people debate that acclimating fish to the temp is abput all thats needed because gh acclimation actually takes days not a couple hours, if anyone has suggeations on acclimating let me know. From what I've read some opt to acclimated bad to temp and then add fish after about 30 mins. 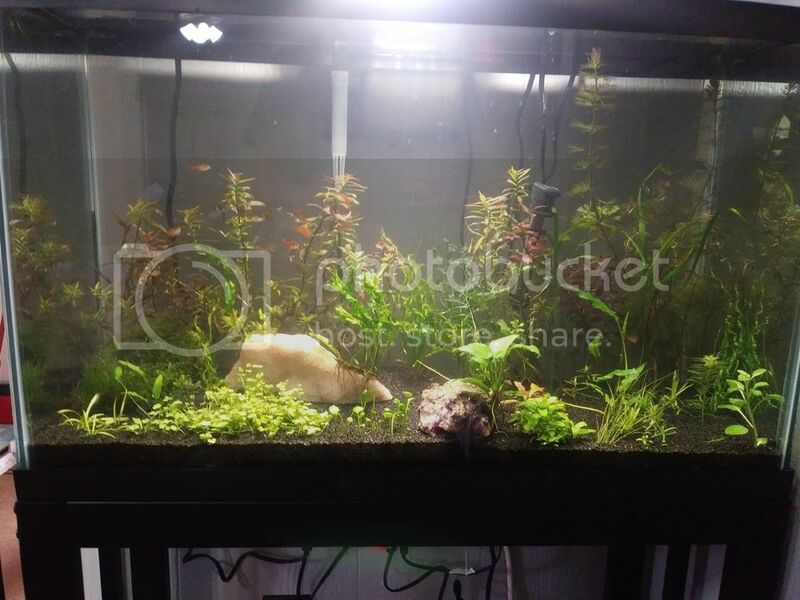 Going to be adding fish on Sunday is the plan, LFS(not so local, 1 hour away) will get in what i'm looking for, a handful of embers and some oto's hopefully, we will see what they get in. Parameters are looking good and consistent of late and I imagine by the weekend it should be safe. 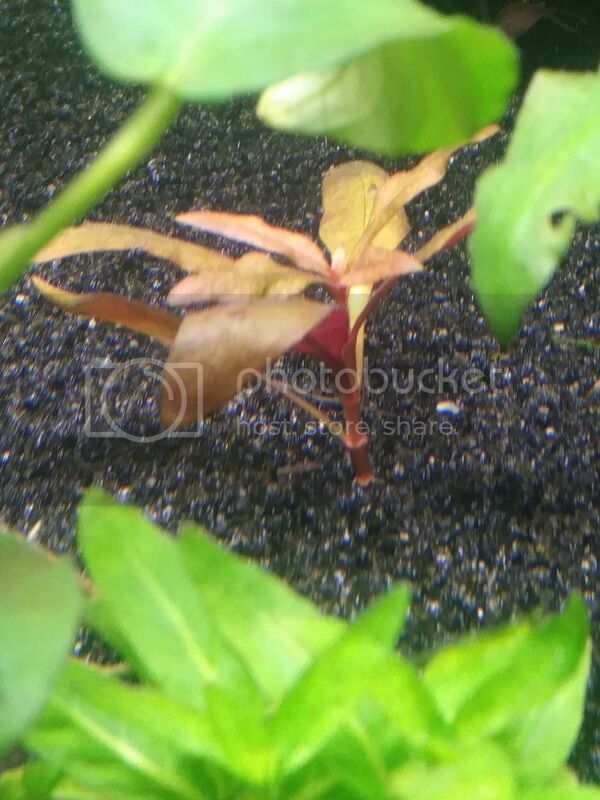 Got picture of a few plants not 100% sure of what all plants are but some I do know names. Here is some java windelov, was concerned about the brown spots at first, but with some searching found that it is a possible propagation method? had anyone ever propagated theirs this way? Stocked the tank with 14 young embers, thinking false julii and some kuhlii this upcoming weekend. People say they interact together well in the bottom of the tank. Plants seem to be perking up, probably post pictures this weekend making it just over a month. So, a larger update here it has been a couple weeks. Firstly a FTS to compare for growth however slow it may be. I removed the floating plants as they weren't liking the HOB filter spraying them. 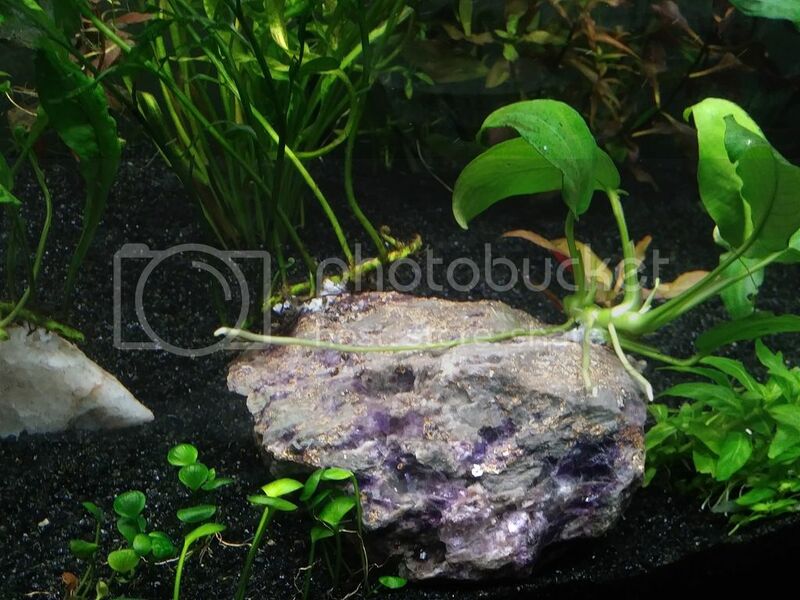 Also adjusted the cabomba and trimmed some of it, as well as rotated the amethyst rock a bit to allow better spacing of leaves from the java fern and african water fern. The plants seem to have definitely adjusted at this point and new growth is seen on all plants now. the picture is with only one light on as with a new lighting schedule with one light on for most of the day and the other 2 on for full light for 7 hours. I think I will adjust this to 6 hours to prevent algae. There's a lot to talk about on the algae front. 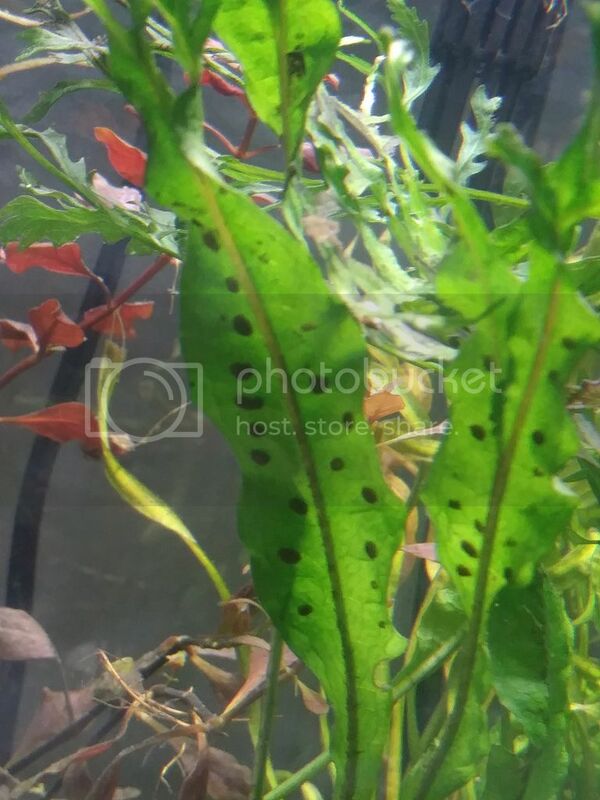 I have green spot algae on plants and the glass, I have dosed phosphate in hopes of supplying the plants with what they need to out compete it as per suggestions I've read on other threads on here. Additionally I have green hair algae on the moss rock on the left of the tank and am currently unsure of what to do about that, with some quick reading I planned on decreasing light a little more as suggested above. I could also raise my lights a touch, up to a few inches, and tweak this over time I guess. And further more a tuft of bush algae on the short grassy stuff in the front left corner ( sorry I only know a handful of plant names). I may try to cut the tip off and take it out if it doesn't explode everywhere in the process. The BBA showed up and hasn't spread or grown since I've notice it a week ago or so...so I'm unsure what to do. In other news I upgraded the tank filter to a aquaclear 50, will use the tetra 20-40 on the 20 gallon I got eventually. Stock wise I now have 9 ottos(one passed), 13 ember tetras, 6 bronze cories, 1 nerite, and however many ramshorn and bladder snails. 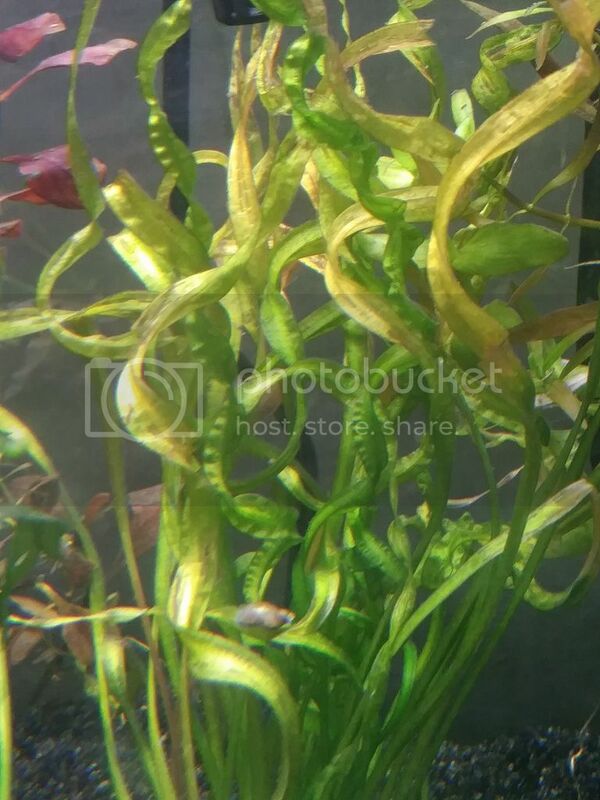 Recently acquired Ick when introducing new fish but the fish affected were the fish that were in the tank already... don't know if they were stressed by the addition or what happened. Been treating 2 times a day with kordon ick attack and recently using seachem stress guard to help them heal up and repel the ick, hopefully this combination works. Also did a 25% WC when most of the ick was falling off them to help get it out of there. Besides that been dosing as per EI calc on Tom Barr's site, I wondered if my phosphates got low because I needed a larger first dose and then dose to maintain...not sure. Going to keep dosing my meds and the ferts and hopfully algae and fish make their respective comebacks. 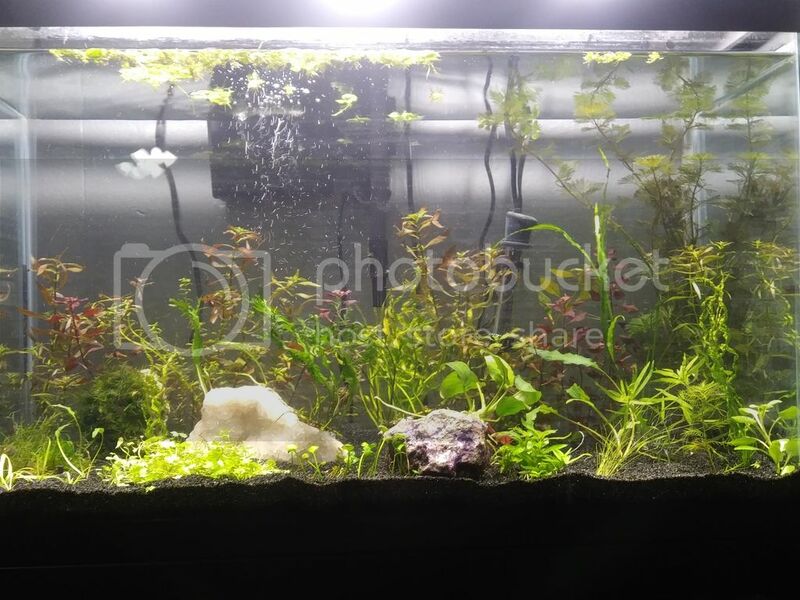 In the mean time, been gathering materials and such for a 55, probably be a couple months to fill and stocking but hsould be very simular to this tank in set up, plants, light, and stock even. So figuring this tank out initially would help with that one. Nice looking tank! Just upgraded to a 29 myself, looking for some inspiration!